Renishaw, a leading metal additive manufacturing (AM) innovator, is participating in the Additive Manufacturing Users Group (AMUG) conference being held this week in Chicago. 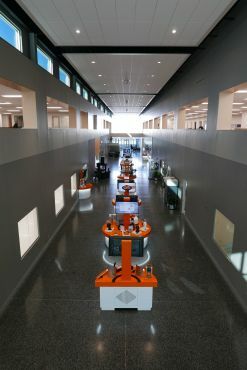 Renishaw is exhibiting components from the aerospace, automotive, medical and marine industries, as well as consumer technology. "We're exhibiting parts from a range of industries to showcase what is possible with AM," said Marc Saunders, Director of Additive Manufacturing Applications at Renishaw. "We are even exhibiting the galvanometer mounting which is a core component of the optical system on our latest machine, the RenAM 500Q." Advanced automotive technology on display includes LED heat sinks, a low-cost, high-volume headlight component with no post-processing required. In addition, visitors to the booth this week have seen an innovative multiple-port exhaust manifold. Aerospace manufacturers have also seen an AM turbine housing, a single-sided temporary fastener and a manifold which has an 85 per cent weight reduction compared with a machined part. The potential of AM for healthcare applications is displayed with exhibits of acetabular cups, orthopedic implants and dental plates. Acetabular cups form part of a hip replacement, with a textured surface to aid bone growth to secure the implant. Dental laboratories can also benefit from cost-effectively producing multiple components in a single AM build, each customized to a specific patient. 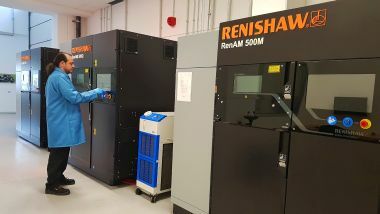 "Our customers are already experiencing how Renishaw's multi-laser technology is increasing productivity and advancing part quality," explained Saunders. "AMUG provides us with a platform to share our expertise with new entrants to the market and those looking to increase the productivity of their AM processes."